The Sutherland Institute is hosting a significant event on 31 Mar at 7:30 pm in their "Celebration of Marriage". Ryan T. Anderson will be the featured speaker. Reservations are available for those wishing to attend. 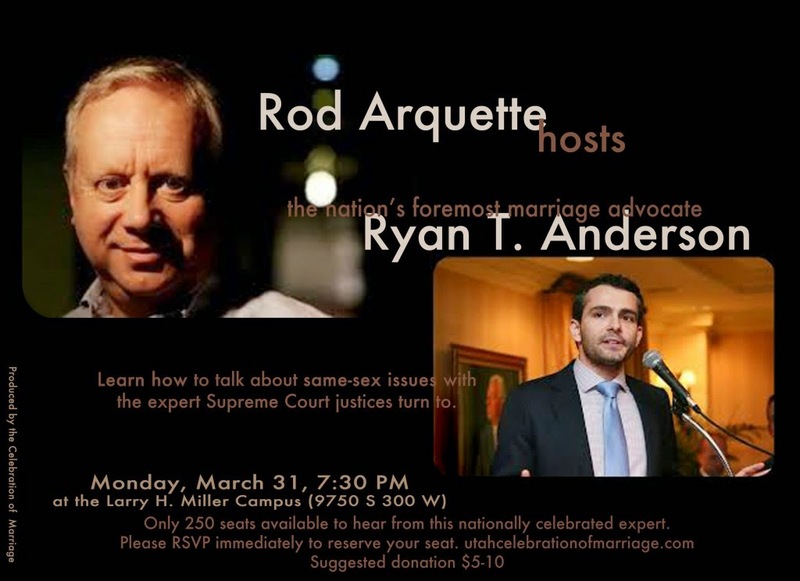 Also available online now at the Celebration of Marriage site are videos of the speakers that were featured at the "Stand for Marriage" rally held in the Utah State Capitol on 28 Jan, as well as a link to the Ryan T. Anderson event with Rod Arquette. It was an informative presentation, followed up by a Q&A session with Anderson and Arquette fielding questions from the audience. Thanks again to Mary Summerhays for helping to bring this all together. Though it got off the ground rather slowly, the presentation is well worth watching. First, redefinition of marriage eliminates upholding the ideal that all children deserve a mom and a dad. It is being replaced with the proposal that marriage is now about nothing other than consenting adult relationships. Second, the slippery slope. Redefinition risks opening the door to any arbitrary radical relationship as "marriage", thereby eliminating the "monogamy" standard, replacing it with temporary trendy fads. Third, compromise of religious liberty by government forced "discriminatory discrimination". As evidenced in government regulation against adoption agencies and child care with religious basis, services that act on the religious ideals of owners. "Red herring" argument that pleads for "gay" hospital visitation. This issue has been settled years ago by "power of attorney" regulations, and the problem no longer exists anywhere in the US. Divorce and "gay" marriage. Single definition for "marriage". This is an "up and coming" industry for lawyers. Convoluted legalistic issues. This was one of the chief justifications for DOMA. "End game" predictions. Using the law and government to force others to recognize arbitrary "marriage" redefinition. No real "live and let live" concessions. Why not pursue legal counter-suit? Some issues currently appealing to Supreme Court for review. Results of social studies. After decades of evidence that traditional marriage is best, isolated non-representative sampling studies argued that lesbians are best. Most divorces are implemented by women. Maleness is promiscuous. Where is this all going, what to do to moderate? Possibilities. Appropriate response in comparison to Supreme Court "Roe v. Wade". Continued pro-life fight against abortion over time as an example. Another video presentation from Sutherland Institute's Paul Duncan. Discussion of proceedings at Tenth Circuit Court at Denver CO, 11 April 2014.